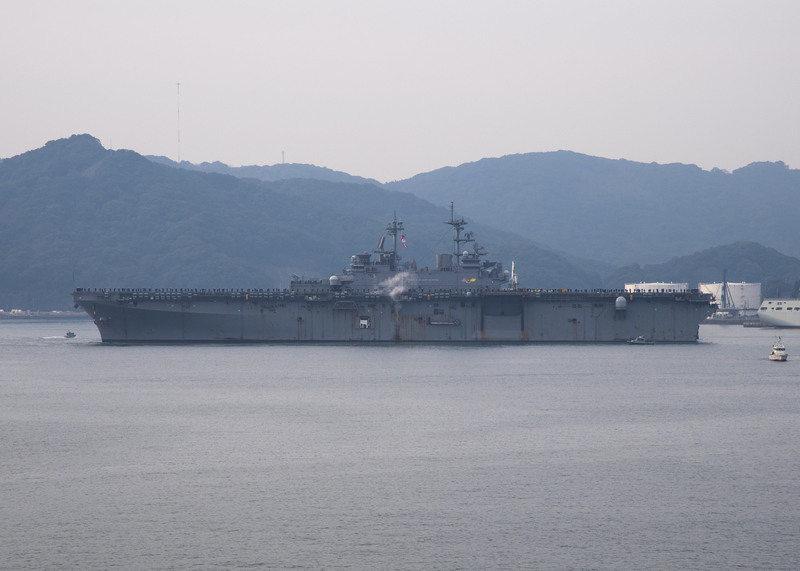 After less than a year in Japan, the amphibious warship USS Wasp (LHD-1) is preparing its sailors to return to the East Coast next year, USNI News has learned. Wasp, one of two amphibious warships certified to operate Marine F-35B Lighting II Joint Strike Fighters, is set to return to Naval Station Norfolk, Va., in late 2019 as part of a previously set plan to balance the F-35B capability across both coasts, a defense official confirmed to USNI News. A U.S. Pacific Fleet spokesperson confirmed the ship would eventually move to Norfolk but would neither provide a timeline for the move nor what ship would replace Wasp, citing a Pacific Fleet policy of not discussing future ship movements. “We don’t have any additional announcements on homeport shifts at this time,” Lt. j.g. Rachel McMarr told USNI News. Wasp departed Norfolk on Aug. 30, 2017, and arrived in Japan in January. While serving in the Forward Deployed Naval Force-Japan, Wasp conducted the first U.S. amphibious ready group patrol with F-35Bs, which were assigned to the 31st Marine Expeditionary Unit. The previous FDNF-J amphibious flagship, USS Bonhomme Richard (LHD-6), had operated from Sasebo, Japan, for six years before relocating to San Diego in May. 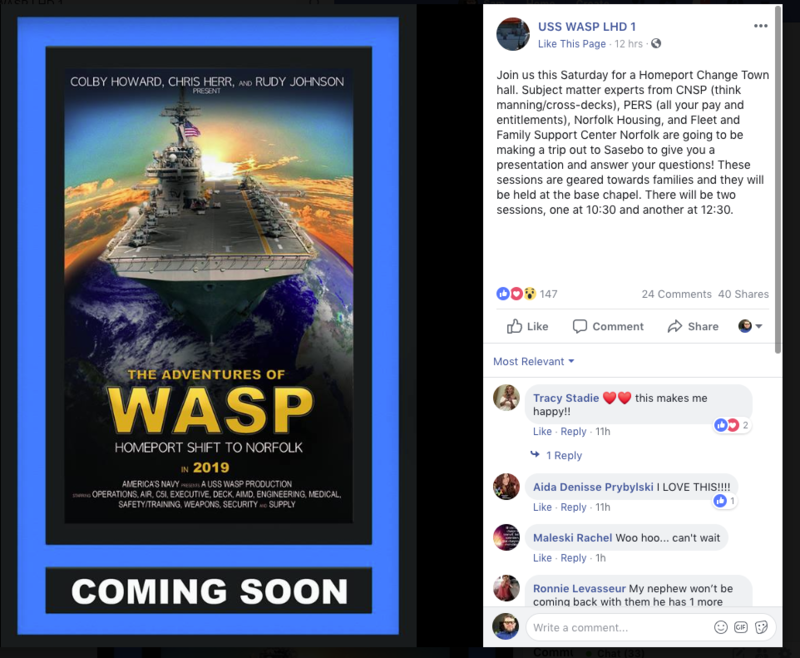 While the Navy wouldn’t comment on the timing, the USS Wasp (LHD 1) Facebook page posted a notice on the transition with a movie poster mockup with the title, “The Adventures of Wasp: Homeport Shift to Norfolk in 2019.” Two defense officials confirmed the planned 2019 date to USNI News this week. USNI News understands the Navy is committed to have a F-35B-capable amphibious assault ship operating in Japan to support the forward-deployed JSFs of the “Green Knights” of Marine Fighter Attack Squadron (VMFA) 121. Of the nine big-deck amphibious ships in the U.S. inventory, only Wasp, the currently deployed USS Essex (LHD-2) and USS America (LHA-6) have launched and recovered Marine F-35Bs at sea. USS Makin Island (LHD-8) began an availability last year that would upgrade the ship to operate the fighters, USS Boxer (LHD-4) underwent a similar maintenance availability that completed in 2017 and Bonhomme Richard is set to start a maintenance period that would add that capability to the big deck. Pacific Fleet has been guarded about ship movements in its area of responsibility in accordance with a policy established by current commander Adm. John Aquilino. The Essex Amphibious Ready Group and the John C. Stennis Carrier Strike Group both deployed earlier this year with no public notice.